Create an employee experience people rave about - Gallup. The employee experience is a journey. It's a journey that can inspire your people, at every touchpoint, to perform at their best. Or, it can create a frustrating workplace culture. When people feel connected to your culture, they perform better. Experiences are everything to people. And their feelings about your workplace directly affect their retention, engagement and performance. Getting feedback at important stages in the journey helps you understand what resonates with -- or frustrates -- workers about your culture. Using the right feedback helps you create the culture you want. of employees strongly agree that their organization does a great job of onboarding. Find out more in Gallup's Perspective on Designing Your Organization's Employee Experience. 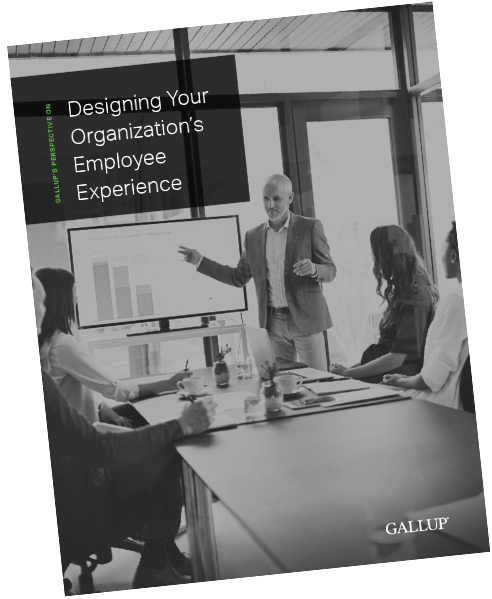 Read Gallup's Perspective on Designing Your Organization's Employee Experience to learn how to build an employee experience that helps you connect your employees to your culture and improve your employment brand. Measure, monitor and improve every touchpoint that drives your culture. You'll find these surveys in Gallup Access. And we're building more every day. Get the right questions for any point in the journey. Choose from over 200 questions to monitor your culture and find out what your employees are experiencing. Or create your own questions to get the information you need at any time. Don't guess. Measure exactly what matters most to engagement. The most engaged teams, as measured by our Q12, experience an average of 17% higher productivity. Find out more in our State of the American Workplace report. It's a simple approach. But it's the one that works. The 12 items on Gallup's Q12 employee engagement survey measure what matters most to employees -- and tie to organizational success. Find out if your employee experience improves your customers' engagement. Your loyal customers spend 23% more with your business over the average customer. Find out more in our State of the American Consumer: Insights for Business Leaders report. Your product and price -- and even customer satisfaction -- may be better than anyone else's. But it's not enough to increase your profits. The true differentiator for your business is how your employees make people feel. That's why we measure something different. We find out if your employees help you create true believers -- the people who buy more, spend more and tell others about you. Find out the best ways to keep your star employees. 51% of current employees are searching for a new job or watching for new opportunities. That number climbs to 60% for millennials. Why do your star employees really leave? When you discover the answer -- which will not be based on hearsay -- you discover how to prevent it from happening again. Does your organization want an employee experience that people rave about? We'll be your strategic partner to make it happen. Learn about our full approach and consulting services on employee experience. Create a journey that inspires commitment. Request a demo today.